Cuba Educational Travel (CET) is a leader in cultural travel to Cuba. 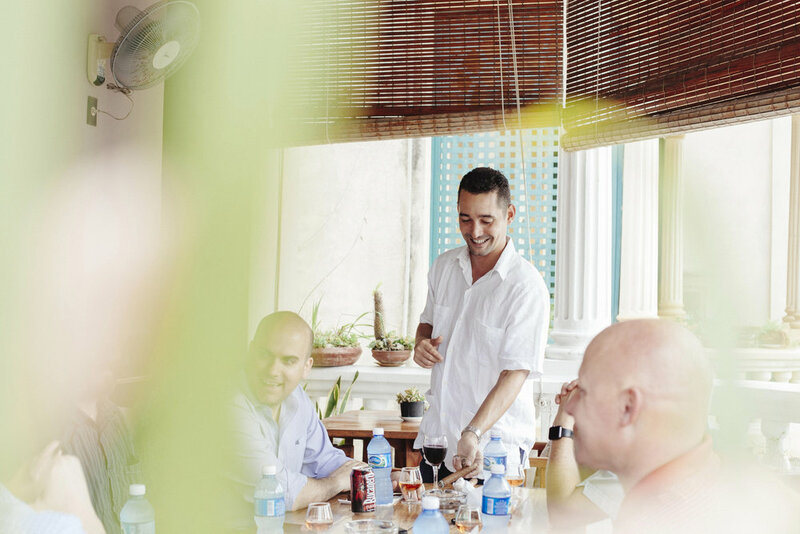 CET unlocks the best of Cuba by providing access to the country’s top artists, academics, tastemakers, and cultural figures. CET’s tailor-made programs enable clients to experience Cuba’s vibrant culture and gain a deeper understanding of the island, while ensuring full compliance with all U.S. regulations. CET has been on the frontlines of cultural collaboration, helping to bring Cubans to the U.S. and Americans to Cuba. From Yoga retreats to concerts to dance performances, CET has wide-ranging experience and contacts. Recent highlights include organizing the Diplo Major Lazer concert in Havana, which drew a crowd of over 500,000 people and bringing Lizt Alfonso Dance Cuba, the country’s top dance group, to perform at the Latin Grammys. The trip will be led by Bill Trumbull, an old Cuba hand having traveled there since 1998 leading student and community groups and doing research. He teaches a course at The Citadel in Charleston, SC on the Cuban economy and, as part of that course, takes his students to Havana for ten days of cultural experiences and lectures from Cuban scholars, artists, community leaders, and government officials. Bill’s interest in Cuba is part of a broader research and teaching interest in the socialist and post-socialist economies. In 1991, he spent a month in the Soviet Union working with Soviet scholars on regional aspects of perestroika (economic restructuring) in the Soviet Union for a special edition of the International Regional Science Review. He spent four months in Hungary as a Fulbright Scholar in 2012. His research in the socialist and post-socialist economies has been published in the International Regional Science Review, Post-Soviet Affairs, Cuba in Transition, and the Journal of Small Business and Enterprise Development. In addition to his course on the Cuban economy, which he first taught in 1999, he taught a course on the post-socialist economies of Europe, which included a trip to either the Czech Republic or Poland. He has also led a study-abroad trip to China. He has presented his research in China, the Czech Republic, Estonia, Georgia, Hungary, Poland, and Ukraine. In 1994, he was awarded an honorary doctorate by the Donetsk Polytechnic Institute, Ukraine. Arrival to Havana (pending flight information). Check-in at local accommodations. Orientation talk with your local host: overview of the agenda, discussion about local transportation, nearby markets, internet access and other logistics, safety, cultural norms and current events in Cuba. Welcome discussion and overview of Cuban economy with trip specialist, Bill Trumbull. Bill will discuss the ongoing economic reform process in Cuba, and explain the history, present, and future of Cuba’s economy. The talk will give great pretext for the week to come. Welcome dinner at Río Mar, located in the luxurious Miramar neighborhood, it has a whole terrace overlooking where the Almendares river flows into the sea. Go to La Zorra y El Cuervo Jazz Club. You will partake with Cuban fans and enjoy a performance by the new generation of jazz composers and musicians. Behind the scenes tour of Old Havana. Walk around the old city to witness Cuban life first-hand. Visit to local bodegas, markets and the popular gathering places where locals play dominos and discuss about sports, transportation, jobs and other topics of their daily life. Lunch at Doña Eutimia paladar. Famous for its ropa vieja and frozen mojitos, this cozy paladar made at La Makina Gastro Bar, located near the Museum of the Revolution and the Museum of Fine Arts in the heart of Old Havana, it is known for the exquisite cuisine dishes and a charming ambiance. Socio-economic discussion with urban planner Miguel Coyula, whose presentation will touch on housing, infrastructure, investment, and restoration programs in the city. It’s bound to leave you with a better understanding of why Havana looks the way it does today and possibilities moving forward. Visit to the Lizt Alfonso Academy, a women-led dance company and school for local youth, specializing in various types of dance. We will watch a private performance by the adolescent dance group and sit with the dancers afterward to discuss how they came to join the school and the impact it has had on them. The talent and work ethic at this school is impressive. Sunset cocktails and private performance by Cimafunk, singer, composer and producer, and one of the leading emerging artists in Cuba. His music is an original fusion of funk, Cuban music and African rhythms, with lyrics directly from the streets. At Malecon 663, an authentic Boutique B&B along the crashing waves and seawall. Enjoy a ride in classic American cars from the 1950s. Not only will we be riding in style, but we’ll be taken care of by Nostalgic Cars, the first private car service on the island. Owners Nidialys Acosta and Julio Alvarez have taken advantage of the recent economic opening to put together a fleet of over 20 pristine clasicos to provide professional service to their clientele. We’ll explore areas of the city we’ve yet to see, including a stop at the Nostalgic Cars garage, where they work hard to restore these beauties. Behind the scenes art tour: Visit different homes and neighborhoods to tour the studios and galleries of established and up-and-coming Cuban artists. Enjoy lunch at Paladar Atelier. This restaurant is equally known for its atmosphere and exquisite cuisine. The lighting and textures of the house, which was home to a pre-revolutionary senator, coupled with walls adorned in modern art, create a cozy, but modern setting. We will be joined by private business entrepreneurs to talk about taxes, licensing, and other elements of running their businesses. Visit with La Reyna y Real, a female hip hop/jazz duo. The group’s music focuses on breaking down stereotypes in Cuban society, including machismo, healthy relationships, gender relations and race. They will share info about their interesting musical journey and insight into the challenges and opportunities young Cubans face. Rum and cigar tasting at Café Madrigal. A local expert will explain the qualities and traits of fine Cuban rum and cigars, pairing them together for the perfect match. Café Madrigal, owned and run by film director Rafael Rosales, is housed in a beautiful colonial mansion with the walls lined with captivating artwork. Check-out and depart for Cienfuegos, referred to as the “Pearl of the South,” is one of Cuba’s only cities to display French and Spanish architecture. Housed on one of the country’s largest bays, the city offers beautiful ocean front landscapes, and is deeply rich in culture. Lunch at Finca del Mar, a modern paladar overlooking the calm waters of the Cienfuegos Bay. Visit to the beautiful Palacio Del Valle in the Punta Gorda neighborhood. This palace is an architectural jewel and a National Heritage Memorial in Cienfuegos, a place of cultural events, restaurant, bar and museum. Tour of Cienfuegos by the City Historian’s Office. Visit to Parque Marti, a UNESCO World Heritage Site and national monument. This vast square is revered for its historical importance and symbolic significance, not only because it is the official site of establishment of the city but also due to an architecturally noteworthy group of buildings surrounding the square. See Palacio de Gobierno, home of the provincial government, it is said to be modeled after the Capitol in Havana. Continue to Trinidad, a UNESCO world heritage site, known for its cobble stoned streets, pastel colored homes and small-town feel. Enjoy a home cooked breakfast prepared by your host. Walking tour of the historic center with Nancy Benitez, a local architect, historian and restoration specialist. Ms. Benitez will provide an overview of the city’s history from an architectural, economic and infrastructural point of view. Along the way, meet with local artists and entrepreneurs and learn about the city traditions: arts and crafts, embroidery and pottery. Enjoy lunch at Paladar San José, a nice restaurant with a diverse menu featuring everything from lobster to pizza. Suggestion: Visit Playa Ancon. A ribbon of white beach on Sancti Spíritus' iridescent Caribbean shoreline, Playa Ancón is often considered as the finest arc of sand on Cuba's south coast. It is located just 15km away geographically and is a popular getaway for travelers and locals alike. Dinner at Los Conspiradores paladar, located at the foot of the main plaza and the lively Casa de la Musica. TBD Check-out and return to Havana and depart for airport. (pending flight information) Boxed lunch en route.